"Join Jesse and his crew of maverick mechanics as they rip, grind, and burn, turning ordinary street vehicles into monster machines in the Monster Garage." Following the success of its inaugural season, it was no surprise to see a second season of Monster Garage on the Discovery Channel. Jesse James and his band of mechanical outlaws are up to their old tricks again, converting one man's junk into another man's ultra-cool monstrosity of a car. 1. When completed, the car must look like stock. 2. They can only spend $3,000 on parts. 3. They are allowed one item that they don't have to pay for. 4. They have seven days and nights to complete the task. Even though this DVD set is being marketed as "Season Two," most of these episodes aired during the second-half of the first season of the show, therefore not utilizing the increased spending limit and allowance of one "freebie" item. Why this DVD set wasn't just called "Season One, Vol. 2" is beyond me. Mega Mulcher: You know you're in for one of the rare duds in this series, when Jesse James himself isn't enthused about this project, involving turning a 2002 Chrysler PT Cruiser into a wood chipper. Snow Mobile: A 2003 MINI Cooper goes under the knife, axe, etc. this time. James and the crew change it into the coolest snow mobile you'll ever see, although it's a bit useless sitting in sunny California. Wedding on Wheels: An already large 1994 Chevrolet Suburban C2500 gets even bigger, in order to accommodate its new function: a wedding chapel on wheels. Dune Demon: A 1990 Mazda RX-7 quickly becomes a dune buggy that doesn't exactly function the way they initially hoped. Ultimate Half Pipe: A 1997 Winnebago is taken in a completely different direction and turned into a half pipe for skate boarders. The legendary Tony Hawk is here as well to help build and test out this new contraption. Mud Thrasher: The subject of the next project is a 1973 Chevrolet Corvette Sting Ray. The task is to make a mud racer, and Jesse and his crew pull it off, making a machine that would make anyone want to go off-roading in it. Hot Dogster: An average, everyday New York City hot dog cart is taken away from its daily life and changed into one heck of a drag racer. The Rock Crawler: A 1968 Ford Bronco is turned into a rock climber. The task in this episode came about as the result of a viewer's suggestion. Tundranatar: A 2003 Toyota Tundra and The Terminator become one, as Jesse changes the vehicle into a T3-inspired cycle launcher, with the help of Arnold Schwarzenegger's stunt double and that film's production designer. The Demolisher: James employs an all-female team to help him change a 1970 Pink Cadillac Coupe Deville into a Demolition Derby Car. Low-Ridin' Rodeo: To the rodeo we go, with the help of an old 1970 Ford Ranchero that is now a scary-looking mechanical bull. Shark Boat: The first of the episodes that actually aired in Season Two has a 1981 Kayot Pontoon boat change into a rather poorly-constructed shark observation ship. Donut Shop Squad Vehicle: One of the funnier episodes, also actually from the second season, finds Jesse changing a 1998 Ford Crown Victoria cop car into, fittingly enough, a donut shop on wheels. Image Transfer Review: The full-frame presentations of these shows are virtually identical to the ones in Monster Garage: Season One. All 13 episodes look very similar to their original broadcast counterparts, featuring sharp, detailed images throughout, and a wide color palette in use. Again, there is a tiny bit of video noise, but this is never a distraction. Audio Transfer Review: Again, the only audio option is Dolby Digital 2.0, but this is fine, given that the shows sound nearly the same as they did on TV. This mostly dialogue-driven show keeps most of the sound up front, with the surrounds only coming to life for some of the show's music. Under the Hood: A bonus episode of Monster Garage. Full Throttle Preview: A look at the other Discovery Channel shows available on DVD. Extras Review: There aren't many extras here, but what is here is a bonus episode of Monster Garage called Under the Hood. This episode gives us a behind-the-scenes look at how the series came about and what goes into filming an episode. There's also a preview showing clips of other Discovery Channel shows that are available from Sony Pictures Home Entertainment. 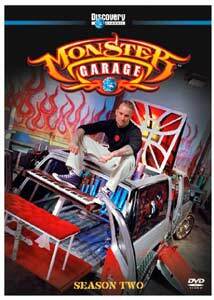 Another wonderful, addicting season of Monster Garage is available in a nice DVD package. Another 13 episodes are here, complete with the same serviceable audio and video as the first season box. Unfortunately, the only extra is the same bonus episode in that first set, but hopefully future DVDs will see a few more supplements.